For me personally, introduction of the Nikon D700 finally brought about the camera that at long last felt as a warranted upgrade from the Nikon D70s that I had used from May 2005. The main reason for not replacing my D70s with its successor, the D80, or any of the three–digit DSLRs in the Nikon lineup, was that I never felt quite at home with the DX format. The advantages that the format offers (extended telephoto reach and greater depth of field for the same angle of view and aperture) are inconsequential for the types of photography that I use DSLRs for. Disadvantages, on the other hand, were quite discomforting—among other things, I loathed the loss of the intimate knowledge of focal lengths, inability to effectively replicate the look of out–of–focus areas produced by full–frame (35mm/FX) cameras and small, dim viewfinders. And of course, the main advantage of full–frame DSLRs over their DX counterparts in terms if image quality is that they tend to push performance edges—they offer more megapixels for a given pixel size or better high ISO performance and greater dynamic range for a given number of megapixels. Nikon D3 was the first full–frame DSLR to be produced by Nikon. I, however, have never liked cameras with integrated vertical grips due to the excessive bulk; the price was prohibitive, too. 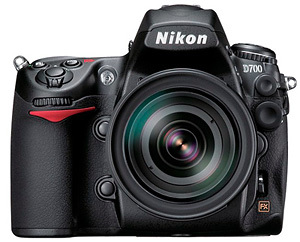 Hot on the heels of the highly acclaimed D3, however, came the D700. No integrated vertical grip, the same imaging and, generally, 95% of the performance of the D3—all, very impressively, at a significantly lower price that approached the realm of affordability. Time to upgrade had come. I always shoot RAW. This means that I will have nothing to say about JPG settings, in–camera processing and related features. I always shoot in auto–white balance (AWB) mode and fine–tune colours in post processing as dictated by my creative intentions; I am not interested in accuracy of colour reproduction. I am not going to scrutinise technical specifications of the D700. The basics of the camera are well known: 12.1 megapixel full–frame sensor with vibration cleaning, ISO 200–6400 expandable up to ISO 25600 and down to ISO 100, 5 frames–per–second continuous shooting with auto–focus tracking, viewfinder with 95% coverage and 0.72x magnification—all in a magnesium alloy body with a 3.0" 922,000 pixel LCD display. The rest of the finer (and, arguably, less consequential) details can be found on better Web sites. With this as a background, I will be posting my thoughts on the Nikon D700 in parts as I gradually work on them. Click on the links below to read about the aspects of the camera's performance that are of interest to you. All photographs here were taken with the Nikon D700.